The Treaty of Karlowitz was signed on 26 January 1699 in Sremski Karlovci, in modern-day Serbia, concluding the Austro-Ottoman War of 1683–97 in which the Ottoman side had been defeated at the Battle of Zenta. It marks the end of Ottoman control in much of Central Europe, with their first major territorial losses after centuries of expansion, and established the Habsburg Monarchy as the dominant power in Central and southeast Europe. Following a two-month congress between the Ottoman Empire on one side and the Holy League of 1684, a coalition of the Holy Roman Empire, the Polish–Lithuanian Commonwealth, the Republic of Venice and Peter the Great, Tsar of Russia, a treaty was signed on 26 January 1699. On the basis of uti possidetis, the treaty confirmed the then-current territorial holdings of each power. 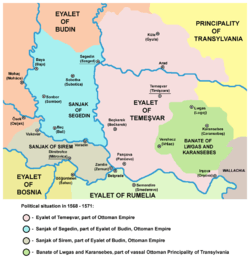 The Habsburgs received from the Ottomans the Eğri Eyalet, Varat Eyalet, much of the Budin Eyalet, the northern part of the Temeşvar Eyalet and parts of the Bosnia Eyalet. This corresponded to much of Hungary, Bosnia and Herzegovina, Croatia and Slavonia. The Principality of Transylvania remained nominally independent but was subject to the direct rule of Austrian governors. Poland recovered Podolia, including the dismantled fortress at Kamaniçe. Venice obtained most of Dalmatia along with the Morea (the Peloponnese peninsula of southern Greece), though the Morea was restored to the Turks within 20 years by the Treaty of Passarowitz. There was no agreement about the Holy Sepulchre, although it was discussed in Karlowitz. Commissions were set up to devise the new borders between the Austrians and the Turks, with some parts disputed until 1703. Largely through the efforts of the Habsburg commissioner Luigi Ferdinando Marsigli, the Croatian and Bihać borders were agreed by mid-1700 and that at Temesvár by early 1701, leading to a border demarcated by physical landmarks for the first time. 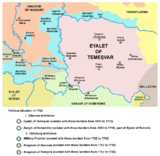 The acquisition of some 60,000 square miles (160,000 km2) of Hungarian territories at Karlowitz and of the Banat of Temesvár 18 years later, at Passarowitz, led the Austrian Empire of the Habsburgs to its largest extent, cementing Austria as a dominant regional power. Political situation in 1568–71, before the treaty. All territories shown are Ottoman eyalets or vassals. 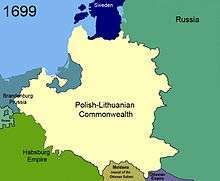 Polish–Lithuanian Commonwealth in 1699, after the treaty. Note the Ottoman loss of territory at the bottom of the map. 1 2 3 4 5 6 7 8 9 Gábor Ágoston (2010). "Treaty of Karlowitz". Encyclopedia of the Ottoman Empire. Infobase Publishing. pp. 309–10. ISBN 978-0816-06259-1. ↑ János Nepomuk Jozsef Mailáth (gróf) (1848). Geschichte der europäischen Staaten (Geschichte des östreichischen Kaiserstaates, Band 4) [History of the European States (History of the Austrian Empire, volume 4)]. Hamburg: F. Perthes. pp. 262–63. Wikimedia Commons has media related to Treaty of Karlowitz.